Want a summer holiday with maximum sun exposure for minimum hassle? Make the short hop to the Channel Islands for the best that Britain has to offer, with a sprinkling of French je ne sais quoi. When it comes to hotels, we think one of Jersey’s nicest – and there are plenty of luxe options to choose from – is L’Horizon Hotel & Spa. Thanks to its prime location in the middle of beautiful St Brelade’s Bay, it must win the prize for best view in Jersey, hands down. But it’s not only the view that draws the visitors; four-star luxury, top-class dining, a sea-view pool and sumptuous Elemis spa treatments make L’Horizon one of the island’s most desirable destinations. 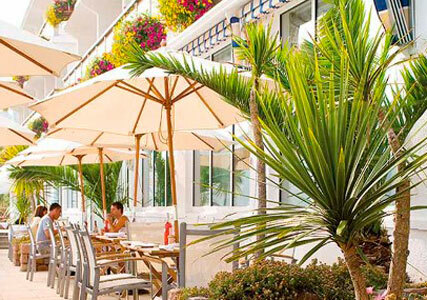 While the soft golden sands and clear blue waters give Jersey a distinctly Mediterranean feel, the hotel itself retains a classically British air. Bright and spacious, it’s sizeable – 105 rooms – but manages to feel pleasingly intimate, with plenty of calming spaces for guests to relax in, from the bar with its reassuringly squashy sofas to a beachfront terrace that’s made for al fresco dining and cocktails at sundown. To really make the most of L’Horizon’s location, book an Ocean View room – there’s no better way to start your day than pulling back the curtains to reveal the vast expanse of beautiful sandy beach. Plus, who wouldn’t want to sink into a super-sized, super-luxe bed every night? The only problem you’ll face is dragging yourself out of it for breakfast or for a dip in the invitingly sparkling pool. And with plenty of spa treatments on offer, you also have the chance to get buffed, bronzed and pedi-ready – just in time to hit the beach. The food scene on Jersey is vibrant and thriving, which is reflected in the hotel’s wide choice of eateries and the executive chef’s passion for local produce. Take your pick from the fine-dining on offer at the hotel’s top-class restaurant The Grill, or head to the Crystal Room for an array of impressive dishes using the best seasonal ingredients. We feasted on the freshest fish and just-picked Jersey Royals – and it’s well worth timing your visit for the asparagus season. But if you fancy venturing further afield, wander up the beach to local institution The Crabshack for just-caught seafood in a laid-back, surfer’s paradise setting. Friendly staff, beautiful surroundings and a refreshingly slow pace of life combine to make a stay at L’Horizon something genuinely special and it’s all just a short hop from airports like Gatwick and Southampton. So join those in the know in this secret gem of a holiday island – it won’t stay secret for long. Book your trip to Jersey with Channel Islands Direct. Visit ChannelIslandsDirect.co.uk or call 08444 937 486.